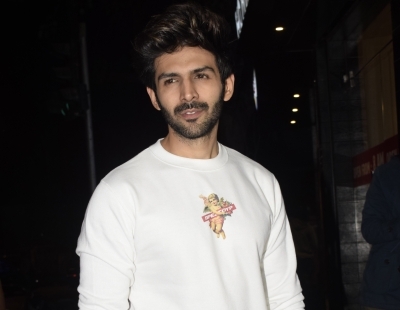 Mumbai, Feb 13 (IANS) Actor Kartik Aaryan says there is no special person in his life and he will be celebrating Valentine's Day with his mother. "This time around, I am celebrating Valentine's Day with my mother," Kartik said. "I am not going to attend any party or function on that day. And I don't have any special person in my life to celebrate Valentine's Day," he added. The actor opened up about his plans while interacting with the media at the 4th Annual Brand Vision Award here on Tuesday. The "Sonu Ke Titu Ki Sweety" star is happy with content-driven films becoming successful. "I am happy that films of talented actors like Vicky Kaushal, Rajkummar Rao and Ayushmann Khurrana are doing so well. I think we are in a good space where content is considered as the king. "The audience is appreciating content-driven films." He will soon be seen in "Luka Chuppi", which will hit the screens on March 1 this year.